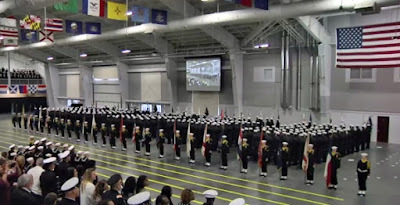 Well, she did it -- Younger Daughter has now graduated from Navy boot camp! 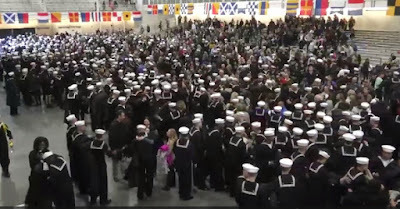 The graduation ceremony was Wednesday, Nov. 22 (the day before Thanksgiving). 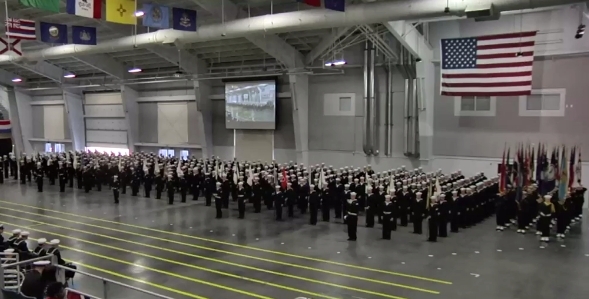 The link to the ceremony is here, but it won't be active for much longer (maybe a week or so). 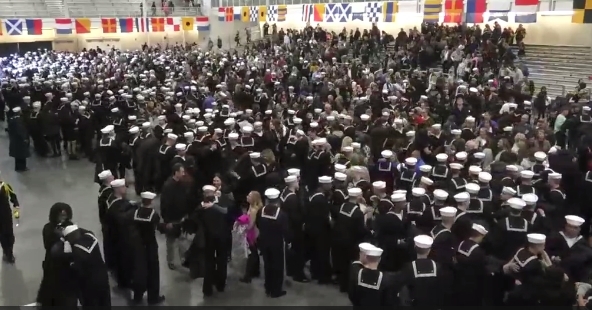 We watched every minute of the ceremony, from the beginning to the end, when the newly minted sailors were given liberty. Younger Daughter very much enjoyed boot camp. 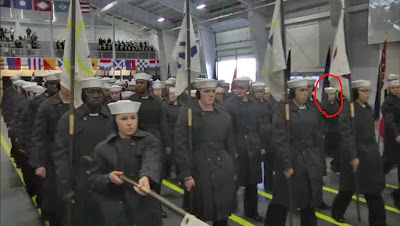 She liked the discipline and camaraderie, and the challenge of learning the military way of life. In fact now that she's across the street and getting ready for "A" school, she says she misses the military bearing so strictly enforced in boot camp. It is just as difficult to see your kid live like we did, all I could say to the person next to me (another mom) was that he was the one in blue, USAF, we both laughed. Congratulations YD. bravo Zulu to your sailor. what MOS is she striking for?? She'll be in AECF (Advanced Electronics Computer Field), Electronics Tech. Congratulations YD!! My son graduated in March. It is quite an accomplishment!! Good for her & GO NAVY!!!! You and Don have done your job. You have raised and taught 2 youngsters how to get along in the world and be good upstanding citizens. That is all you can do, and I think you did it very well. Congratulations! Congrats to your daughter! Hope you have a great Christmas together! Congrats to YD, as well as you and Don...and how nice it will be to have both girls home for Christmas! Congratulations! It seems to have gone by quickly but then I am not her Mama. How thrilling to be past the first stage! Hurray and congratulations to YD and you two! Congratulations!! Enjoy having the girls home for Christmas. ...but that doesn't seem to help much. I would like to personally congratulate you as your blog Rural Revolution has been selected by our panelist as one of the Top 100 Housewife Blogs on the web. Let me be the first jarhead to say, "Congratulations, you are the proud parents of a squid." ;-). 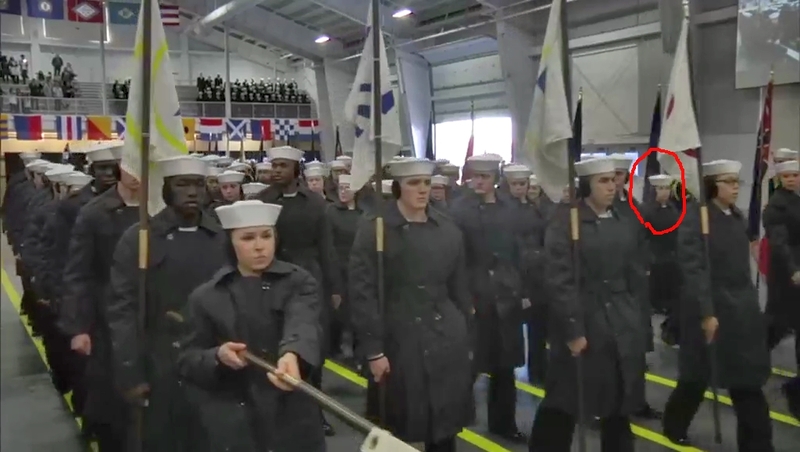 Coming from a grunt that is a compliment to a sailor! Thank you for your service Marine. 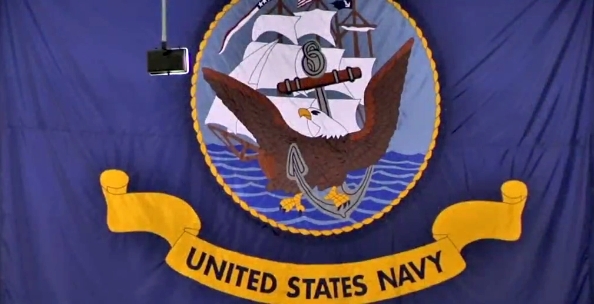 My boot camp graduation was in NATTC Great Lakes in January of 1976, that video gave me goosebumps. 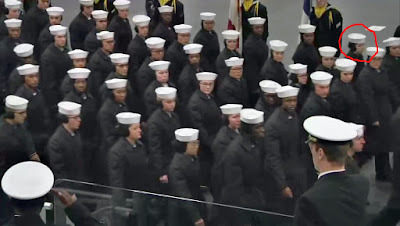 Congratulations Younger Daughter, welcome to the United States Navy. We were actually on the phone with Y.D. when your post came through. I was able to convey your greeting directly to her, and she thanked you. The whole world is in front of your sailor. I was a country boy from Indiana who had never seen an ocean and the Navy showed me the Pyramids, Europe, Africa, South America and some of the most beautiful islands on Earth. Whether she stays for one hitch or for a career she is in for the time of her life. Misspelling Petty Officer in my last post was a tad embarrassing, so I correct it here, lol. She's just starting "A" school, and hopes to ace her classes so she can have her choice of where her first duty station will be (a privilege given to the top rankers in class). You're right, the whole world is in front of her. I'm confident she's well suited to the Navy way of life. There used to be an extra stripe in it for being number one in your class, not sure if they still do that. What A school is she attending? I was in the Navy, but it was January when I went in and chose to go to San Diego for boot training, unlike your daughter - I hated it, but it those four years were an amazing experience. She's in Advanced Electronics/Computer Field.